High-Quality and Affordable Rip Rap & River Rock Services on Lake Norman, Mountain Island Lake, Lake Hickory, Lake Wylie, Lake Rhoadhiss, High Rock Lake & Lake James! Living by a body of water can be a peaceful and enjoyable experience. However, if you frequently visit a lake or pond near your home or business but believe its appearance could be enhanced, rip rap will change the way the divide between the land and water near your home or business appears. 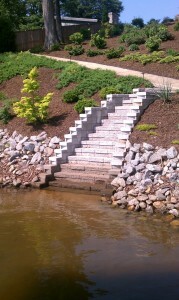 Renegar Construction is a marine construction company that services the Mountain Island Lake area, as well as the rest of North and South Carolina, and is highly capable and skilled when it comes to installing rip rap & river rock. Rip rap & river rock can be made from a variety of different stone types. The most common stones used for rip rap are granite and limestone. Depending on your personal preferences, the type of stone used for your rip rap border is up to you. The aesthetic benefits of rip rap & river rock should not be overshadowed by its functional advantages. The stones of a rip rap border absorb the energy of waves before they are able to reach a building or other type of structure. This diminishes the water’s ability around a building or structure to erode materials that are close to shore. Since rip rap is constructed using a large number of stones, the construction process can get expensive. However, at Renegar Construction, we keep our costs low and competitive. If you are concerned about the effect water from the shoreline is having on your property, rip rap & river rock can be affordable and attainable when you work with us. We are known throughout the Mountain Island Lake area for being highly dependable, experienced, and professional.